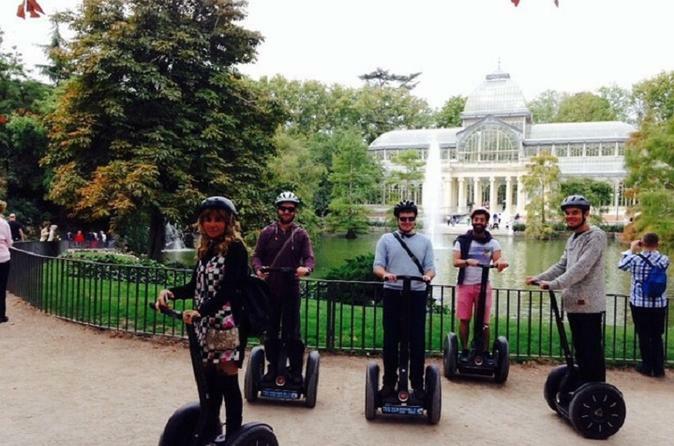 Hop on to your Segway and enjoy a ride to perhaps the most beautiful park in Madrid. The journey begins in "Plaza Mayor", a landmark in traditional Spanish architecture. Once the home of bullfighting and fearful religious trials, it’s now the perfect place to get a sense of Madrid’s long history. Then you will head for the "Barrio de las Letras", or Literature Quarter, a place which was home to some of Spain’s major literary figures, such as Cervantes and Lope de Vega. Going through Calle de las Huertas, you will reach the Prado Museum, the temple of Spanish art, and make ypur way past one of the most beautiful churches in Madrid, the "Iglesia de los Jerónimos", before arriving at the "Retiro Park". For around 40 minutes, you'll see everything this amazing park has to offer, including a lovely pond, a crystal palace and a monument to... the Devil! Apart from its monuments and beautiful landscape, Retiro park is an ideal place to enjoy the Segway, gliding through its large avenues. On the way back from the park, you will still be able to see important monuments like the "Alcalá Gate", the "Cibeles Palace" and "Puerta del Sol', the true heart of the city.